I took a friend from college who had never heard of the J. Geils Band. ("Whammer Jammer" had been one of my favorite songs to party to the previous summer.) But we were both huge Yes fans. And rightfully so, since they were then and still are the best band on the planet. took us to a higher place. It snowed and snowed and I wondered if I should make the 2 hour drive to Pittsburgh from up North. I had a car load of guys (all getting loaded except for me..the driver). That old Chevy had a great heater, so we went for it. Amazing show! J. Geils rocked us silly, and YES took us to heights I had never reached before. I was a fan before the show, but a lifelong fan from that point on! I remember Jon making a comment about the election in the US. I thought the tone was that of simpathy as to the winner. Sort of "you're in for 4 more years". But the last thing on my mind was politics! YES WERE AMAZING!!! It's 30 years later...same band and same amazing music!!!!!!! Thank you! The venue for the Pittsburgh show was the Pittsburgh Civic Center, also known as the "Igloo." Jon mentioned that Nixon had just been re-elected and boos filled the place. It was the first of nine times I have seen Yes and it probably was my favorite! 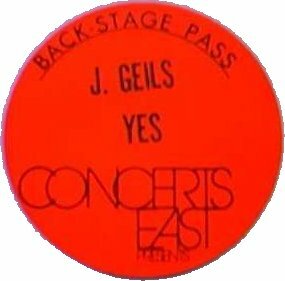 November 7,1972 The opening act was J.Geils Band. It was Election Day and Richard Nixon was being elected to his second term and I saw my first YES Concert!